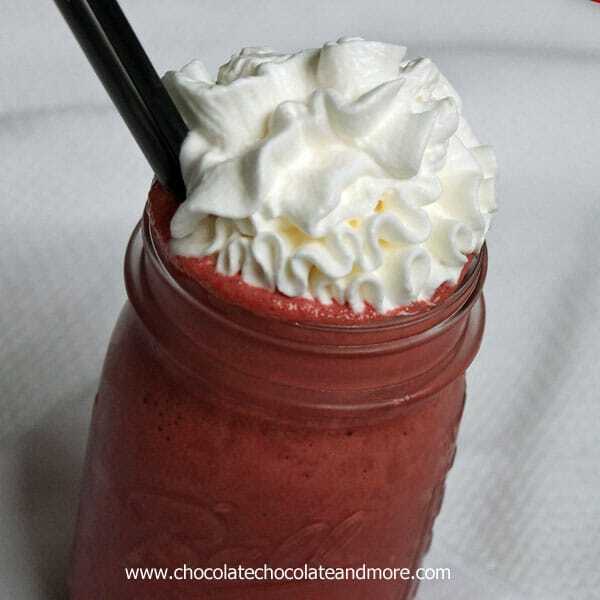 Red Velvet Milkshake - Chocolate Chocolate and More! 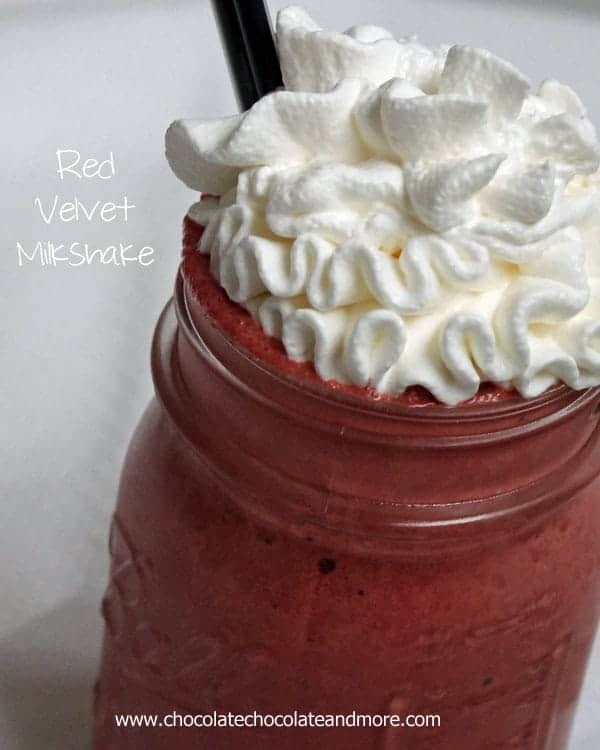 Red Velvet Milkshake-who says you can only have red velvet in cake form! I know it’s winter time. I know some people in the north are freezing their butts off. I know some people find it crazy to want ice cream in the winter. So just call me crazy. There is never a wrong time of year for ice cream in my house. In the warmer months, we’re always making ice cream homemade. In the winter, it’s somehow too cold to make it so I’ll keep the freezer stocked with store bought. Usually just the basic chocolate and vanilla. And usually it’s the big, party size gallon tub. I don’t mind the cheaper ice cream, we rarely just eat it as a bowl of plain ice cream anyway. It’s on top of a pie, with cake. Our favorite is with Apple Crisp. Or we’re turning it into a frozen drink. My older daughter adores Red Velvet Cake. She was the reason I made the Red Velvet Fudge. It was a no brainer when I saw the open cake mix box in the pantry, to use it in a milkshake. We tried it with both vanilla ice cream and chocolate ice cream. Definitely use the chocolate! In a blender, combine milk, ice cream and cake mix. Blend until smooth and thick. Pour into glass and top with whipped cream. Now that got my attention! 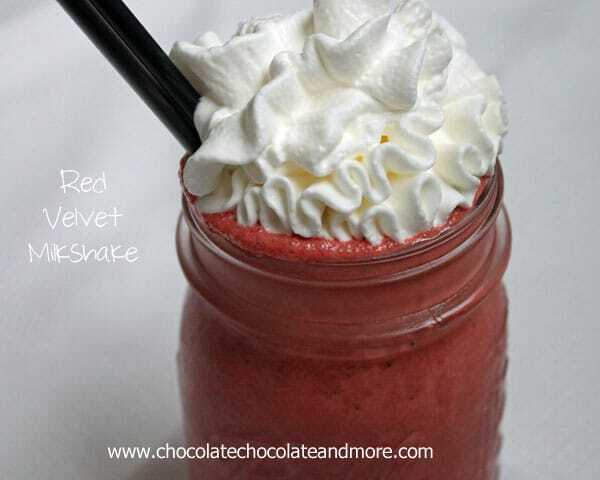 I love red velvet everything and I must try this! Pinning! This is such a fun recipe Joan! There is no time of year that is wrong for milkshakes! Pinning! 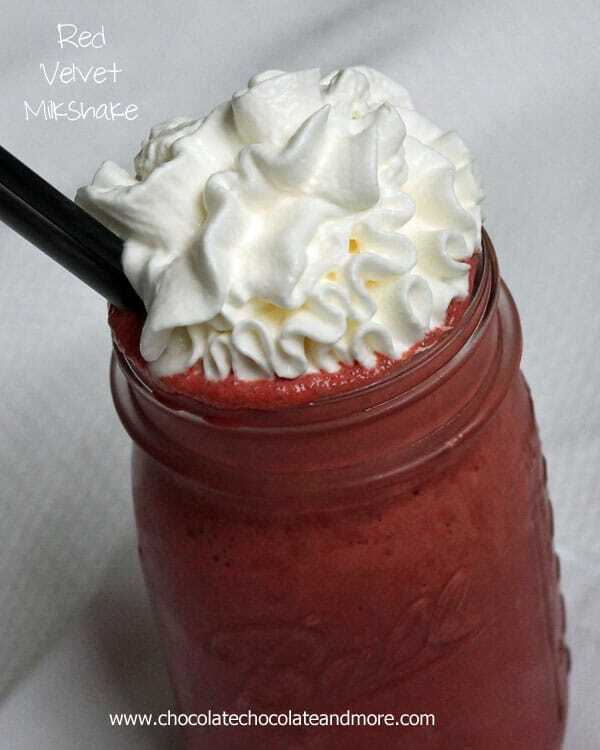 Love how easy this shake is to make! Love Red Velvet! Yummi goodness, Joan! I’m not the biggest red velvet fan on the planet, but you’ll have a hard time getting me to ignore CHOCOLATE! 🙂 PINNED! I would have never thought of putting cake mix into a milkshake, but WHY NOT?! This looks divine and the possibilities are endless. So many cake mixes, so little time. Holy cow Joan, this takes red velvet to a whole new level!! I love it and I WANT it! Ok, the red velvet milkshake looks awesome (there’s cake mix in there? Really? ), but then I scrolled on down and saw the Frozen Mocha Frappuccino and I fell in love. I just made this! Delicious!! I’ll call you crazy and then just dive right on in! 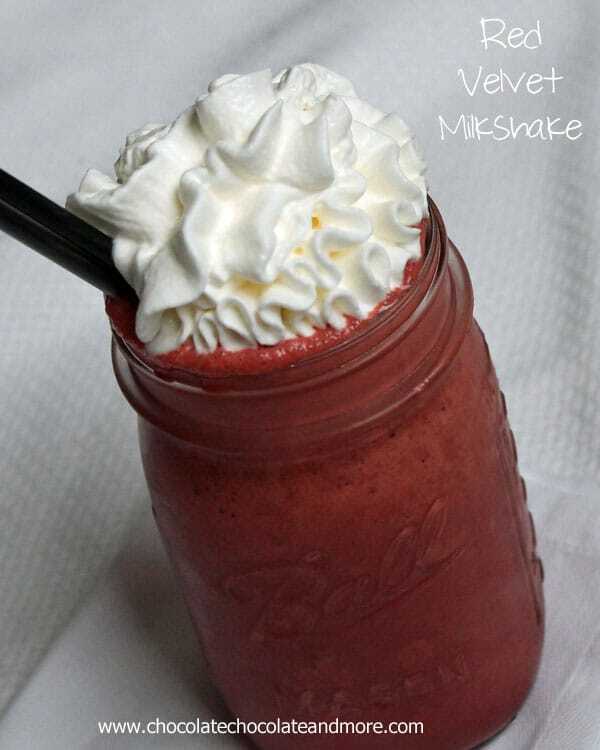 Milkshakes work for me any time of year – especially red velvet!! I’ve got a Red Velvet roundup coming up and this beauty just got added 🙂 Have a great weekend Joan! Oh my goodness I love red velvet everything!!! This milkshake looks epically amazing!